Diving is fun -that’s what we stand for- but only when it’s done safe. We don’t take any shortcuts when safety is involved. We understand you’re on a holiday and we will do everything to make it unforgettable. We go out for a two-tank dive in the morning but we also run a thirth dive in the afternoon. 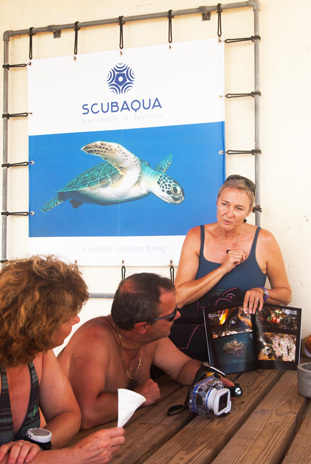 We dive in small groups and before every dive we give you a detailed briefing about the dive site and plan. All the dives we make are guided dives (marine park rule), but we try not to restrict your feeling of freedom. Custom-diving Scubaqua style means we give the experienced diver the dives they want but we also give the unexperienced diver the extra attention they need. Dives are ‘limited’ by the no decompression limits, often exceeding 70 minutes. But despite there being a recompression chamber on St. Eustatius, we don’t make decompression dives. Every staff member is trained to respond in case of an emergency and we always have a captain on board when the divers are in the water. For those who are nitrox certified we offer nitrox for free. When we teach a course, we only have one thing in mind...you. We don’t decide how long a course should last. The only thing we look at is if you, as a student diver, are confident. In practice, this means that when you need that extra dive to feel confident, we make that extra dive. We don’t collect certifications, we collect confident divers!